How to foil art prints – DIY Tutorial. A simple step-by-step tutorial to show you how to elevate your art prints by adding foil. 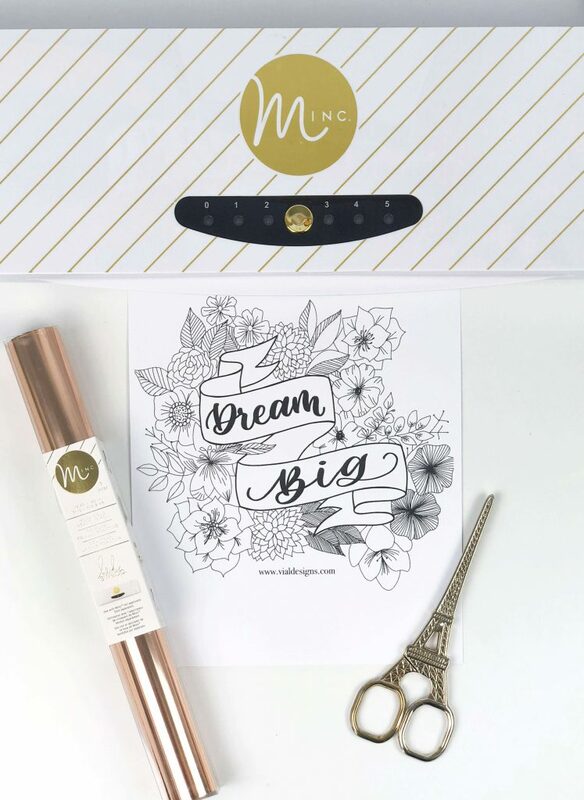 Plus you’ll be able to get the Dream Big inspirational print FREE at the end of this post! Foil prints are so beautiful that they seem extremely difficult to make. The truth is foiling elevates your project instantly, and the actual process is a lot simpler than you’d think! Are you as excited as I’m to try foiling? 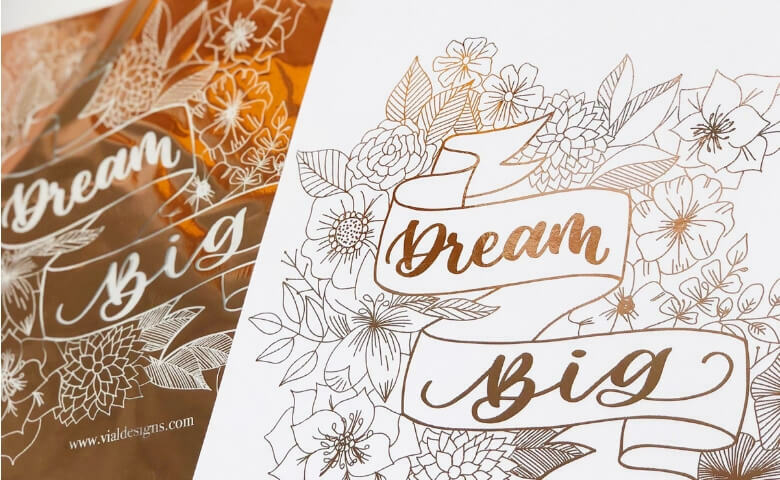 I hope you are because I’m going to show you in a few simple steps on how to foil prints, and create gorgeous art. I’ve had my Minc Machine for a while now. And honestly, I was scared to use it. It looked very intimidating because I had no idea how to use it. My foiling machine stayed on its box for longer than I’m willing to admit. Lately, I’ve been on a quest to do things scared, so I opened the box and decided to give foiling a try. To my surprise, it was easier than I thought. Not to mention extremely satisfying. 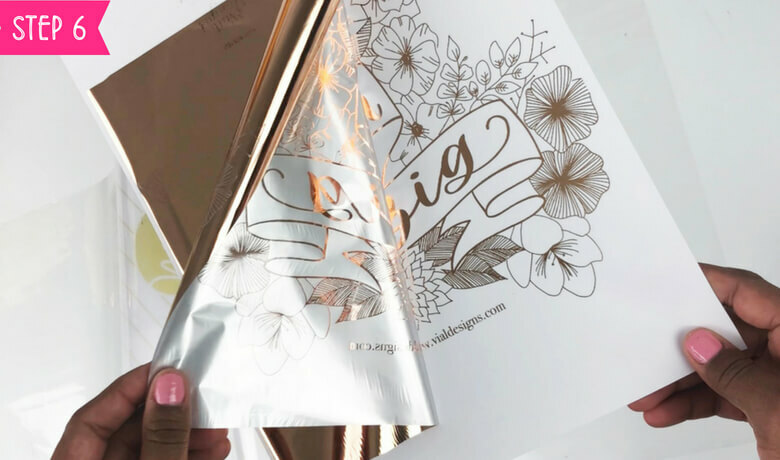 That’s why I want to show you how to create foil art prints using a few supplies and following some simple steps. 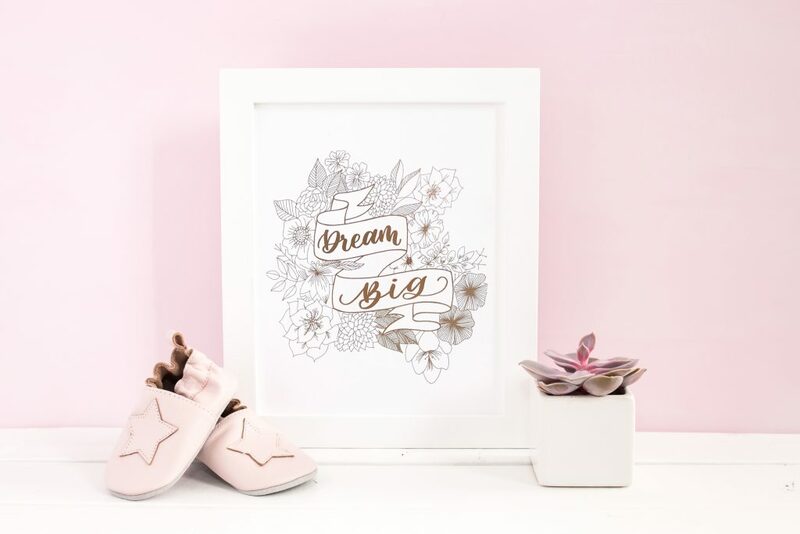 Also, I made the printable I’m using on this blog post (Dream Big Inspirational Print) available to you for FREE. You can get access to it by filling out the form at the end of this blog post. I’m providing Amazon links for your convenience. You can also get these supplies at any craft store like Michaels, JoAnn’s or Hobby Lobby. If you get them there, don’t forget to use their coupons. These stores *almost* always have some promotion or discount coupon going on. Cardstock. I’m using white cardstock for this tutorial, but you can use any color you’d like. Foil Transfer Sheets. They are also known as Reactive Foil. I’m using Rose Gold from Heidi Swap. Minc Transfer folder. I got this starter kit, and it came with everything I needed to start foiling. Laser printer. You don’t have to buy a laser printer. But you do NEED to get your art printed using one. You can get your print done anywhere that makes prints and copies. A few places that come to mine are Staples, Office Depot, or FedEx. Just make sure they print your art with a laser printer. I bought this laser printer. The printer was on sale when I bought it. And at that time, getting that laser printer was cheaper than to buy ink for my inkjet printer. Art print of your choosing. 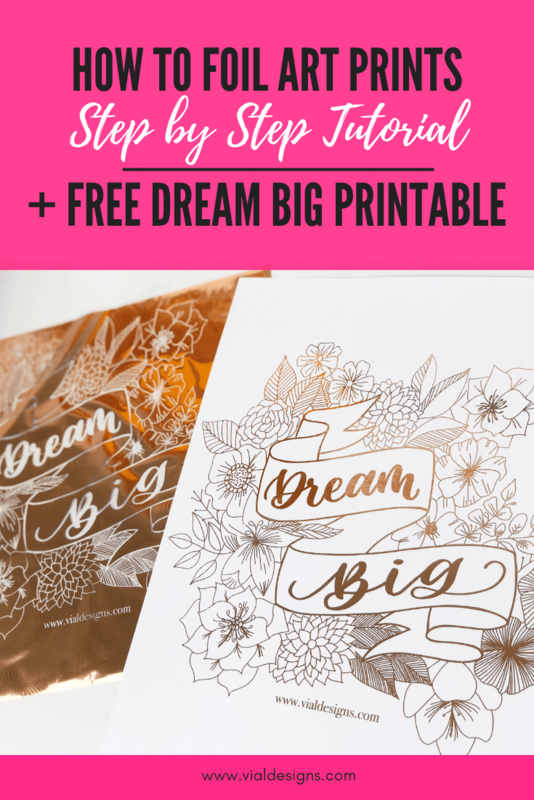 I created this Dream Big Inspirational printable using a banner and florals. (Ps. I’m working on some fantastic blog posts to show you how you can create a design like this one). I loved how it turned out after I added the foiled and I’m SO happy you can have access to it from my resource library. 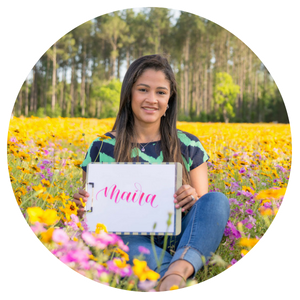 If you don’t have access to my resource library yet, fill out the form at the bottom of this blog post to get in. The tools below are optional. They do make your life easier when cutting the foil sheet to fit your design. And they are great not only for this tutorial but also for DIY in general. But they are not necessary. If you don’t have these handy, use scissors. Now that you have everything you need let’s get to the fun part. HOW TO FOIL! Print any art of your choosing. Make sure it’s printed on cardstock using a laser printer. I am using white cardstock, but you can use whichever color you prefer. 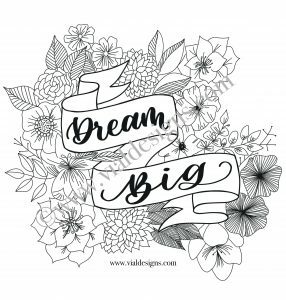 For this tutorial, I will be using my Floral Dream Big Inspirational Art printable. As I mentioned before, I have it available on my FREE resource library, and you can have access to it by filling out the form at the bottom of this blog post. Getting your art printed on a laser printer is essential. The toner of the laser printer is what makes the foil react and adhere to it when the heat is applied. Sadly, an inkjet printer won’t work for foiling! 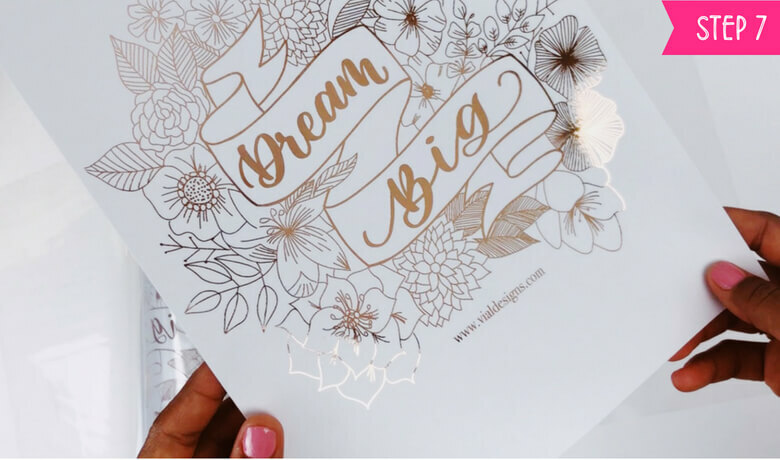 Pick the foil transfer sheet of your choosing and cut it down to the size of your image. You can either put the foil over the design and cut it using scissors. Or if you want to be more precise, you can measure it and cut it using a cutting mat and an X-ACTO knife. Make sure your cut foil sheet completely covers the part you want to foil. Turn on your Minc Machine. For cardstock, I use the #4 setting. You need to wait a few seconds until the red light stops blinking and turns green. The green light is the indicator that the Minc Machine is heated and ready to go. The Minc Machine comes with a set of instructions letting you know which setting you should use depending on the type of paper you are using. Place your print inside the transfer folder. Make sure the image is facing up, and the foil transfer sheet is completely covering the design with the shiny side up. Gently close the top part of the transfer folder over the project making sure the foil sheet is still well covering the design. Pro Tip: make sure the whole design on your print is covered. Even if you don’t want certain parts of your design to have foil, you still need to cover it with a piece of paper. The laser toner will react with the heat and will get stuck to your transfer folder. This will ruin your transfer folder! As you can see in the image above, some black parts are showing. That’s because I didn’t cover one of my designs entirely and part of it got into the transfer folder. 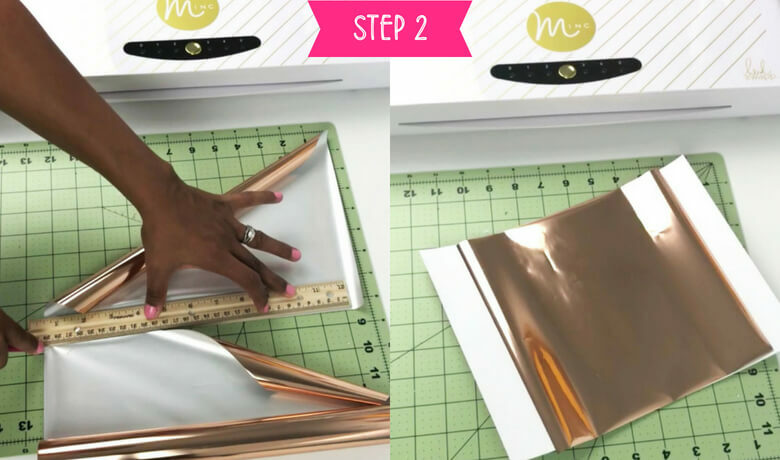 I had to replace my transfer folder after I completed this tutorial because this black part of the design was getting imprinted into all the prints I was foiling! 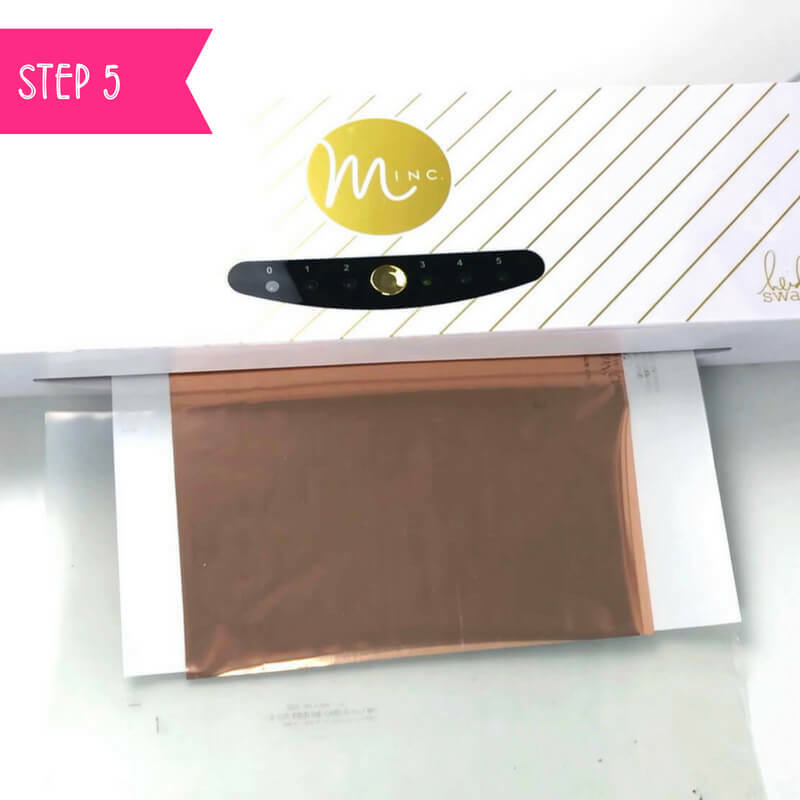 Feed the transfer folder (with your print and foil sheet inside of it) through the Minc Machine. This process takes about a minute. Don’t rush the feeding process. The head of the Minc machine needs time to work its magic! 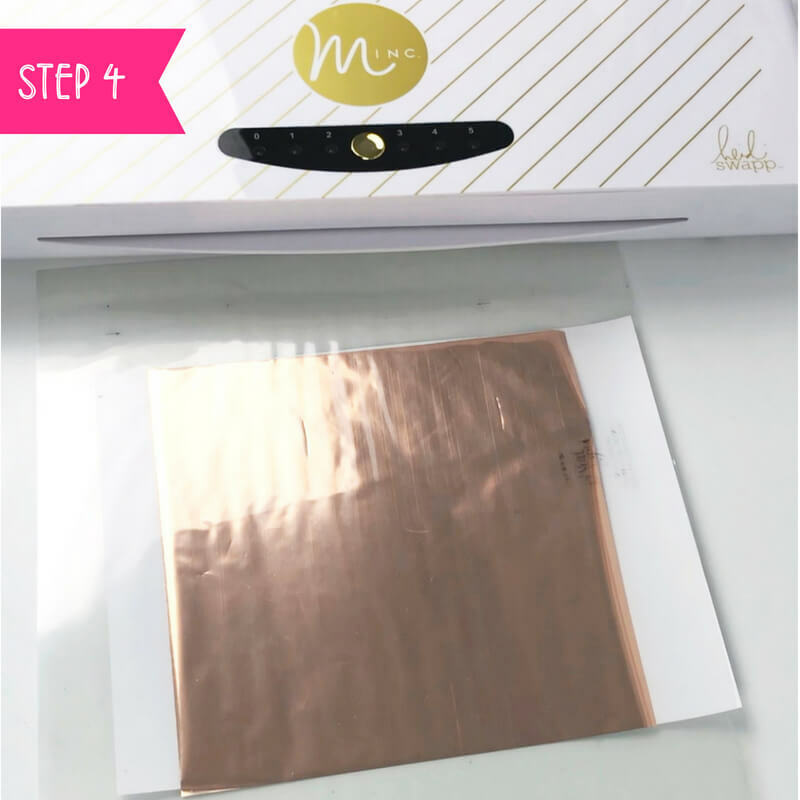 Once the folder is through the Minc machine, remove the print and the foil from it. Then, slowly peel the foil from the cardstock. Peeling the foil is my favorite part! It’s so satisfying to watch the foil pare from the print… Ahhh, if you don’t believe me, try it for yourself. Or watch some foiling videos on Instagram. Take a moment to appreciate your creation! It’s magic!!! Yes, look at that gorgeous print you created! I have to say that probably the only bad thing about foil prints is that they are sooo hard to photograph. It’s so difficult to capture that beautiful shine in photos. But you will appreciate all the shine better in person. You can display the print in your favorite place or frame it! This foil art print makes for a great gift, and it’s beautiful for decor. I hope you find this tutorial helpful and get on a great start to foiling ALL the things. Faux Calligraphy Tutorial – Uppercase letters, and numbers and symbols. Best Brush Calligraphy pens for beginners. I’d love to see what you create. Tag me on @VialDesigns on Instagram and use the #vd_tutorials so I can look at your work. If you have any questions, don’t hesitate to ask them in the comments below. WANT TO REMEMBER THIS? 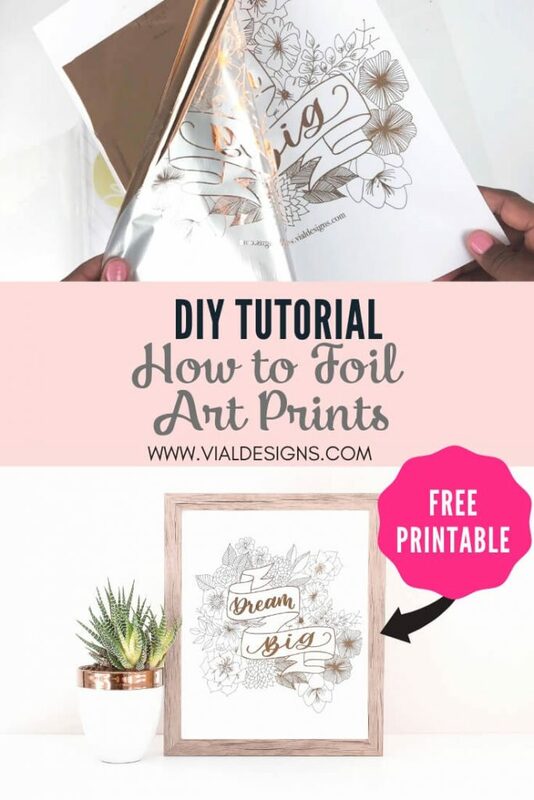 SAVE THIS FOIL ART PRINTS TUTORIAL TO YOUR FAVORITE DIY PINTEREST BOARD! Thank you for reading, and I hope you have a fantastic rest of your day!